CK and Nate header: Double the Roll You Say? Double the Roll You Say? There is a situation in our downstairs bathroom that we aren't thrilled with. Luckily it's not of the gross/smelly kind. This story starts awhile back. We're pretty particular on which toilet paper we use and we usually buy it in bulk at Sam's club. Last time we went to stock up, they were out of our favorite brand (gasp!) and since Will was having a COMPLETE MELTDOWN I quickly grabbed what I thought would be a comparable product so that we could hightail it out of the store (it can be noted that this situation is all my fault... I'm ok with it). 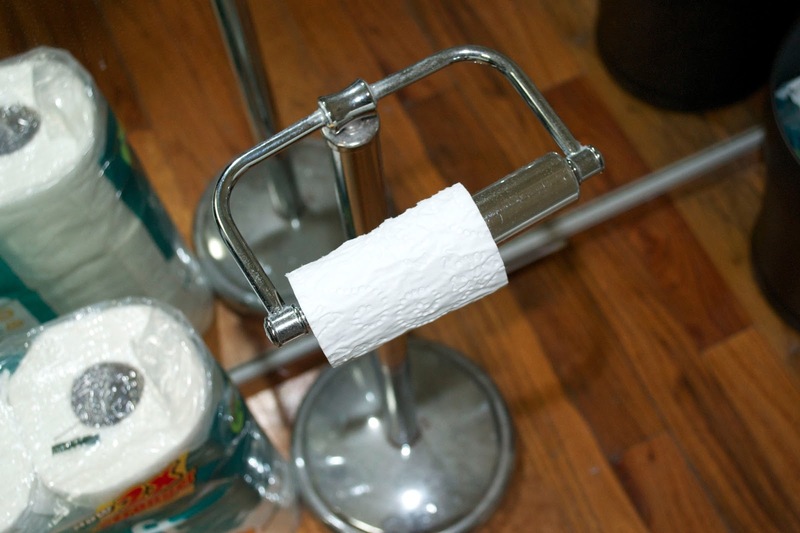 Me: Have you noticed anything weird about the toilet paper? Nate: The stuff in our bathroom? Nate: The fact that it is super tiny? Me: Yeah! Isn't that so bizarre? The brand boast double rolls and 2x stronger and I think I figured out how they are keeping costs down. Not only do we have toilet paper we don't like, but it is a full inch an a half narrower then a normal roll (I measured). The moral of the story? I do not think we will be buying anything but our favorite brand even if we have to pay more at a regular store. At least then we will like it and a double roll will also include a normal size roll. *I'm purposely not giving the brand since I'm fairly sure this is just a quality assurance issue on the pack that we bought. I notice things like this all the time. It is weird. We buy bagels at the store (not a bakery) years ago they came 6 to a pack for less than $1 ...then they started coming 5 to a pack...later the price went up...Sometime after that, another increase and then a big announcement on the side of the pack "NOW with 6 in a pack!" I must say, the TP issue is a problem, especially if you have big hands...and the paper isn't wide enough. Means you have to take measures to fold it differently in order to get adequate coverage. ...not a pleasant subject to talk about. But an important one! I know this is an older post; but my son told us about this when we visited him in August. He says they're "cheater sheets" We just bought a name brand which we always use, and it was a much smaller (in width) roll. Will be careful next time, and watch what I buy. Sneaky! Thanks for the info!